In just 11 astonishing days, the denial of young people’s rights to education, health and care in England has been completely exposed. Evidence of young people being hidden away from their communities, removed from the mainstream, refused the support to which they are entitled and ultimately placed in serious danger has been building and has now burst into the open. Pupils with SEND were almost twice as likely to drop out of education at the age of 16. On Thursday, the Department of Health published a review led by Dame Christine Lenehan, Director of the Council for Disabled Children, triggered by concern about the care, support and treatment provided to the group of children and young people with complex needs (and behaviour that challenges) involving mental health problems and learning disabilities and/ or autism. It followed several high profile cases, including the utterly preventable death of Connor Sparrowhawk, who drowned in a bath at an Assessment & Treatment Unit managed by Southern Health Trust. destinations for these children and young people. You can submit your evidence to Dame Christine Lenehan here. In the same week I was contacted by Martin Vickers MP who confirmed to me that the Department for Education is preparing a consultation on the admission to mainstream schools of children and young people with autism. This follows his meeting with Ed Timpson, the Minister for Vulnerable Children and Families. Yesterday afternoon, the research group Education Datalab unleashed a shocking report showing how pupils have been pushed out of mainstream schools under the nose of the DfE, especially pupils with SEND and especially from ‘sponsored’ Academies (those which joined a Multi-Academy Trust). This is what we have been saying all along: In fact, when Professor of Critical Disability Studies & Psychology at Manchester Metropolitan University, Katherine Runswick-Cole, and I met with Sean Harford, Ofsted’s National Director of Schools, back in January 2015, this is exactly what we told him. It’s what parents tell us all the time: certain types of school are very effective at pushing out children with special needs, without even going through the exclusion process. They don’t want them, they don’t help them, and – as Nye’s report, “Who’s Left?”, demonstrates – they don’t keep them. Yet, as Christine Lenehan says, these are our children. And these are tomorrow's adults. We need to think carefully about that. Well finally it’s out. But will it be believed and more importantly, will anything change ? Doubtful. In a recent letter to the Prime Minister Teresa May MP that I wrote I got a total denial of the above. My child was ‘managed’ out of her Academy aged 13 and ignored by LA for three years and in my County (Cornwall) even now this behaviour continues. So my hopes for a change in the light of this report are seriously limited. So will this report make any difference ? Somehow I doubt it. recently I wrote to the Prime Minister Teresa May MP about just this matter. The response I got was a total denial,’ many parents are satisfied’. In the face of this sort of response what hope for change in the future ? Little I am afraid. 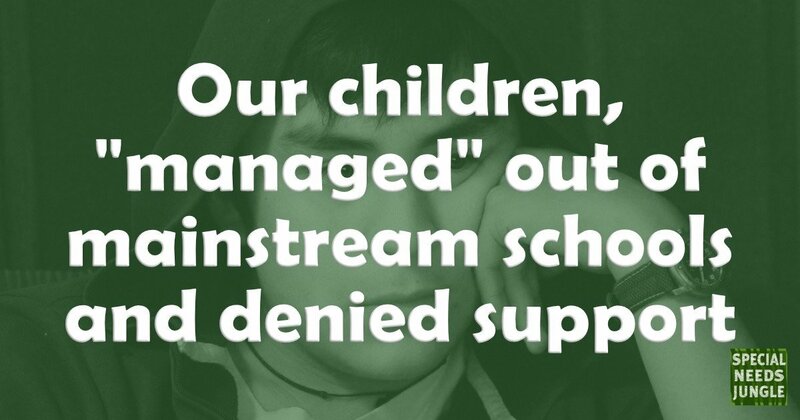 And yet even when autistic children have high IQs and are very academically able, schools continue to deny and/or fail to recognise their difficulties until the child’s mental health suffers and they drop out of school through school-refusal or mental health becoming so severe. If schools put in the right support, or the right school environments were available for autistic children, they could have these children excel and contribute to their precious league tables. It’s not only about the children struggling to achieve what the schools deem an acceptable level. There are autistic children capable of much whose difficulties mean they are not achieving potential. It’s appalling how the education system currently fails these children. At my son’s last school a multi-academy, I requested a key safe for his locker. This was because he kept loosing his key causing him much anxiety and a reluctance to go into school, cost £7.50, I even offered to pay for it. Replacement locker keys costing me as a parent five pounds each time.This was declined as it was unfair to other pupils, other pupils by the way who didn’t have complex learning disabilities or a statement. It was referred to the Head Teacher who declined it siting budgetary restraints, (I offered to pay still a no). I believe that anything that would have encouraged my son to stay at that school would not be done, instead it was better for their results if he became disheartened and left which was exactly what happened. A TA used the F word at my son last week in a special school! She’s admitted it! But now she’s left – it was on her final week she thought she would use the F word at my son! I’m disgusted with the behaviour – this is what our children are being subjected to! It’s no wonder he doesn’t respect teachers – he has ASD/PDA & Severe Anxiety!